Mail is a traditional form that has been used in RFCs for the "Author's Address" and is expressly required "for historical reasons". E-mail is sometimes used, capitalizing the initial E as in similar abbreviations like E-piano, E-guitar, A-bomb, and H-bomb. Internet suite of SMTP, POP3 and IMAP email protocols the standard. Operation The diagram to the right shows a typical sequence of events that takes place when sender Alice transmits a message using a mail user agent (MUA) addressed to the email address of the recipient. Internet Message Access Protocol (IMAP). Internet mail gateway which also does any necessary reformatting. If Alice and Bob work for the same company, the entire transaction may happen completely within a single corporate email system. Alice may not have a MUA on her computer but instead may connect to a webmail service. Alice's computer may run its own MTA, so avoiding the transfer at step 1. 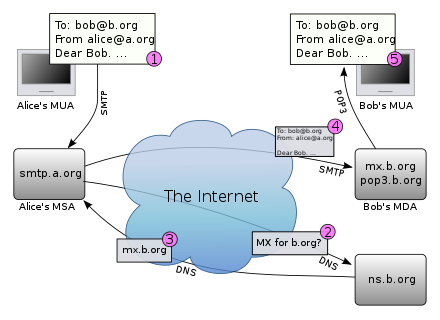 Bob may pick up his email in many ways, for example logging into mx.b.org and reading it directly, or by using a webmail service. Domains usually have several mail exchange servers so that they can continue to accept mail even if the primary is not available. From: The email address, and optionally the name of the author(s). In many email clients not changeable except through changing account settings. Date: The local time and date when the message was written. Like the From: field, many email clients fill this in automatically when sending. The recipient's client may then display the time in the format and time zone local to him/her. Microsoft Exchange respects a fine-grained automatic response suppression mechanism, the X-Auto-Response-Suppress field. Message-ID: Also an automatically generated field; used to prevent multiple delivery and for reference in In-Reply-To: (see below). In-Reply-To: Message-ID of the message that this is a reply to. Used to link related messages together. This field only applies for reply messages. References: Message-ID of the message that this is a reply to, and the message-id of the message the previous reply was a reply to, etc. Reply-To: Address that should be used to reply to the message. Sender: Address of the actual sender acting on behalf of the author listed in the From: field (secretary, list manager, etc.). Archived-At: A direct link to the archived form of an individual email message. Received: when an SMTP server accepts a message it inserts this trace record at the top of the header (last to first). Return-Path: when the delivery SMTP server makes the final delivery of a message, it inserts this field at the top of the header. 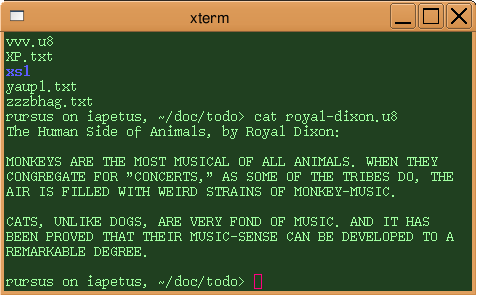 Mail based on the mbox format. Email allows asynchrony: each participant may control their schedule independently. Reducing cost Sending an email is much less expensive than sending postal mail, or long distance telephone calls, telex or telegrams. Increasing speed Much faster than most of the alternatives. Creating a "written" record Unlike a telephone or in-person conversation, email by its nature creates a detailed written record of the communication, the identity of the sender(s) and recipient(s) and the date and time the message was sent. In the event of a contract or legal dispute, saved emails can be used to prove that an individual was advised of certain issues, as each email has the date and time recorded on it. Internet Service Providers (ISP) store copies of email messages on their mail servers before they are delivered. The backups of these can remain for up to several months on their server, despite deletion from the mailbox. the "Received:"-fields and other information in the email can often identify the sender, preventing anonymous communication. web bugs invisibly embedded in email content can alert the sender of any email whenever an email is read, or re-read, and from which IP address. It can also reveal whether an email was read on a smartphone or a PC, or Apple Mac device via the user agent string. Delivery Reports can be used to verify whether an address exists and if so, this indicates to a spammer that it is available to be spammed. If the spammer uses a forged sender email address (email spoofing), then the innocent email address that was used can be flooded with NDRs from the many invalid email addresses the spammer may have attempted to mail. These NDRs then constitute spam from the ISP to the innocent user. Internet Mail, O'Reilly, ISBN 1-56592-479-7. Becky! Eureka Email Forté Agent GyazMail Pocomail The Bat!